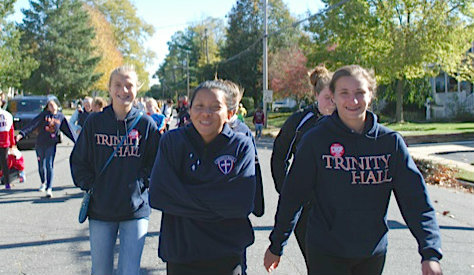 By participating in the Red Bank Crop Walk on Oct. 19, about 30 members of the Trinity Hall community helped raise awareness for hunger. Most students and faculty ran or walked the five-mile course, while others worked at one of the water tables. The entire community collected more than 500 food items to donate to 17 different hunger organizations, and one of the school’s banners earned third place in the banner contest. Lily Scott, co-founder of the Service Club, said that the school first participated in the event last year because service club advisor Melissa Whelan and some students had previous experience. “We thought it would be a great way to start off the year with our first service project,” Scott said. Katie V., Kay F. and Mairead M. walk together in the 34th annual Red Bank CROP Hunger Walk. This year, five members of the volleyball team took on an additional physical challenge by taking part in the lug-a-jug brigade, which meant carrying a gallon of water throughout the five-mile course. “The purpose of the lug-a-jug brigade is to be in solidarity with the people in third-world countries who have to walk up to five miles just to get clean water,” said Whelan, who is also assistant coach of the volleyball team. She was inspired to add this aspect to Trinity Hall’s involvement in the Crop Walk when she saw how many Americans were wasting clean water to participate in this summer’s internet-famous ALS ice bucket challenge, while thousands of people around the world have to walk miles a day for drinkable water. “Last year I noticed some students from Monmouth University doing it, but this year Trinity Hall students were the only ones,” Whelan said. Trinity Hall’s banner, designed and created by students, won third place in the event’s annual banner contest. Before the Crop Walk, the Service Club ran a contest between advisory groups to encourage students and faculty to donate peanut butter, rice and beans that would be distributed to local charitable organizations. The Lambrou/Verga advisory won with 121 items. “We collected a total of 530 items, which is incredibly impressive given the size of our school compared to other schools,” Whelan said. Along with donating food, the freshmen theology classes designed Crop Walk banners for the annual banner contest. One of the two banners the school created and brought to the walk won third place. October 30, 2014 in Archives.